Fall is my Spring. I think because Winter is my favorite season, I love Fall because it’s the gateway to it. In Georgia, fall is cool and dry and just beautiful. Unlike spring, which is humid, damp and hot! I don’t know about y’all, but my hair and skin absolutely LOVE the Fall weather. I think it’s the lower humidity and cool, crisp air. Even using the same products, my skin automatically feels less dry, cleaner and even looks prettier. I do have a secret, though. In the fall, I use my pumpkins for more than just carving into scary faces to sit on the front porch. I use pumpkin on my face. Yes, I really do. Pumpkin is a great source of Vitamins A and C, as well as zinc and alpha-hydroxy acids that help slow the signs of aging. And since I’m knocking on the door of 36 which means I’m almost 40, slowing the signs of aging is important. Unfortunately, pumpkin doesn’t reduce gray hairs. But when eaten, it CAN help with inflammation, prevent cancer and heart disease and other serious ailments. Pumpkin is extremely beneficial for prostate health, too. I have no prostate (and neither does my daddy now) but most of you do so GO EAT SOME PUMPKIN PIE, y’all! But alas, I use it on my face. A quick and easy scrub to use on your face and/or body can be made with three simple ingredients. I know! It sounds like pumpkin pie for your face… and it really is. Only without the butter and calories. All you have to do is mix it up and put it on a damp washcloth and rub in circular motions on your face and body. Try it. I’m dying to know how you feel about it. You can buy products in the beauty section of stores that contain pumpkin. They likely contain other ingredients that help them stay fresh but contain the health and beauty benefits that you would get from real pumpkin. Do you do any special fall-themed beauty regimens during this time of year? I have loved yogurt for as long as I can remember. The yogurt is my main source of protein, as I don’t eat a whole lot of meat. No, I’m not a vegetarian, but I could become one easily. I used to buy just regular ole vanilla yogurt. Normally the lower fat kind, just because I eat so much of it. I was provided a few cups of Dannon Oikos for the purposes of this post and I have to say, once I had my first bite of Dannon Oikos, I was changed forever. The differences between the “other” Greek yogurt I’d been eating and this were huge. It still contains active yogurt cultures, which helps promote a healthy digestive tract. Dannon® Oikos® Plain and Fruit on the Bottom contains 0% fat, while the Dannon® Oikos® traditional blended varieties contains only about 3% fat. Both are an excellent source of protein, twice that of most regular lowfat yogurts. Stonyfield Organic Oikos provides the same delicious flavor and texture of Greek Yogurt, only in Organic form. So now I’m officially a convert to Greek yogurt and since Dannon Oikos and Stonyfield Organic Oikos provide such wonderful flavors like strawberry or blueberry fruit on the bottom, super fruits and honey fig (OMG MY FAVORITE), I can’t imagine going back to only vanilla (or any other brand). The vanilla will always be my go-to for our crunchy yogurt. But I don’t think I’ll ever again buy “regular” yogurt because I’m all geeked out over Greek now. The thickness and extra protein makes it a very filling snack or breakfast, and in a pinch when the husband is traveling, it’s a great supper, too! See how geeky I am over Greek yogurt? 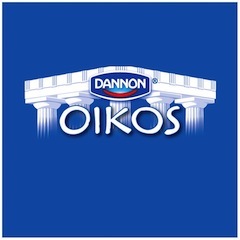 *Oikos is a registered trademark of Stonyfield Farm., Inc. used under license by the Dannon Company, Inc. Ever since we returned from our trip to New York back in the Spring and I loaded the pictures onto my computer, I’ve been dying to have this photo enlarged and put on canvas or a metal of some sort. I couldn’t make up my mind but knew it would be done. And then, like magic, I was contacted by Megan at Easy Canvas Prints about a review possibility for a canvas of a photo of my choice. And in a 16×20 size. Needless to say, I jumped because it was obviously a perfect fit for me. I’d been pondering getting a canvas of this photo done and VOILA! here’s my chance. Ordering on the site was super easy. Simply upload your photo, choose your wrap thickness, move it around to fit in the canvas how you want it, choose the border, opt for retouching, preview and order. Then wait for your package to arrive. It arrived in a HUGE box. I was secretly hoping they changed it from a 16×20 to like a 30×40 but once I opened it, I realized it was just safely packed. To say my eyes welled up with tears when I saw this, would be an understatement. Look at that face. And look at the hands… they WRAP around the edge so it looks like he’s holding the picture! Oh, I die! Unfortunately, we’re still in our cruddy apartment and I didn’t have anywhere fabulous to put it, so I hung it here to show you how gorgeous. The lighting is funky but I have to tell you, his face on the print actually lights up the room! Once we move, it will be residing on the brick fireplace and will look fantastic! I turned off the light for another picture. You can really see how bright his face is and how it lights up the area. Of course (toot my own horn) the photo was amazing to begin with, but this really pulled out the detail and beauty of it. It’s so crisp yet it looks like it’s been painted (it has not). It just leaves me kinda speechless. I am so thrilled that Easy Canvas Prints asked me to review a product for them. I highly recommend them for your canvas needs. The service was impeccable, delivery was VERY timely and the quality is just fabulous. You can find them on their site or on Facebook. Disclaimer: Thank you to Easy Canvas Prints for providing me with the 16×20 canvas print. I received it in exchange for this review and an ad space, though all thoughts and opinions are my own and they didn’t tell me what to say. They also have that cute little button over with my advertisers!